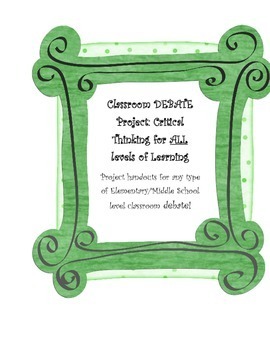 Included in this packet are project handouts for any teacher who wishes to complete an organized in-class debate with their students. This project is “tiered” by readiness, meaning there are assignments geared towards the 3 levels of learning. The project was designed for students to work in debate groups of 3 to prepare, with each level of learning within the group of 3. Each group of 3 would have a different side of the debate (there could possibly be multiple groups of the same side, because each group could have different arguments). 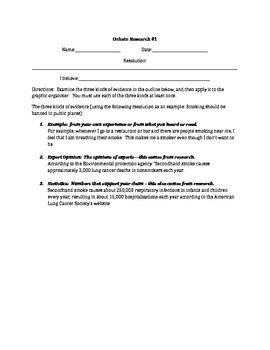 The whole class activity might begin with an overview of the different types of evidence, as outlined in their first handout. Then, the teacher might go over the debate topic of choice, and the assignments. 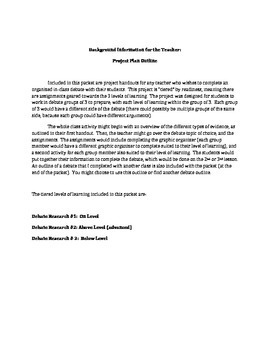 The assignments would include completing the graphic organizer (each group member would have a different graphic organizer to complete suited to their level of learning), and a second activity for each group member also suited to their level of learning. The students would put together their information to complete the debate, which would be done on the 2nd or 3rd lesson. An outline of a debate that I completed with another class is also included with the packet (at the end of the packet). You might choose to use this outline or find another debate outline. 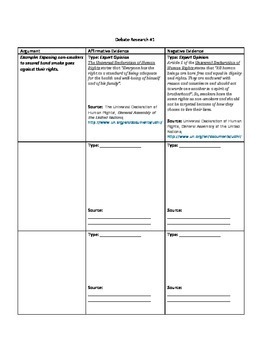 So, included with this packet are 1 total pages: handouts for all 3 level of learning for debate preperation, a teacher background page and a debate outline. Enjoy!